Last week, strategist and project manager Dee Reller guided us through a successful holiday sales strategy! 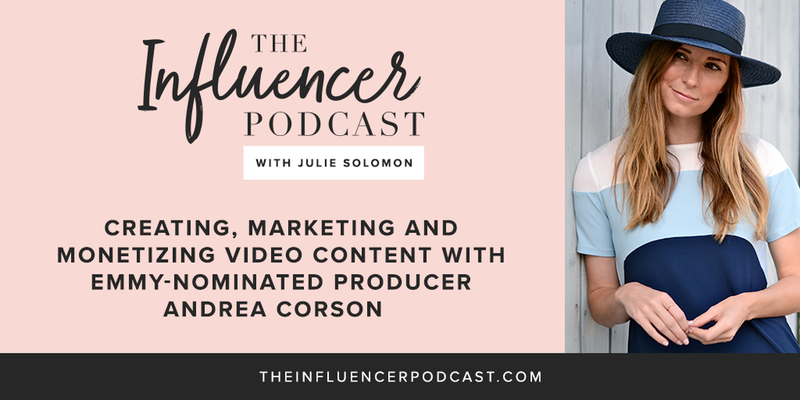 This week Emmy – nominated producer, strategist and course creator Andrea Corson maps out exactly how to Creating, Marketing and Monetizing Video Content. Today it is all about video!!! Yes my friends, the importance of video content in an influencers career is vast, and it is not going away! For many reasons, which we will be discussing today, video can be, for some if not most, terrifying. Andrea is an Emmy-nominated television producer, digital strategist and consultant. She has created awesome video for a wide range of clients including Google, Disney, Covergirl, DSW, Carnival Cruise Line, & Nordstrom, and an impressive roster of start-ups, bloggers, and course creators. A long-time blogger and creative, Andrea has always been incredibly passionate about helping her fellow creatives grow their businesses and audiences, and consequently launched Video Pop, helping these modern entrepreneurs learn how to create the best possible social video for their blogs and social channels. Andrea’s course Video Pop helps entrepreneurs and influencers grow and scale their businesses with video content – be it through recorded courses, masterclasses, and in person workshops.